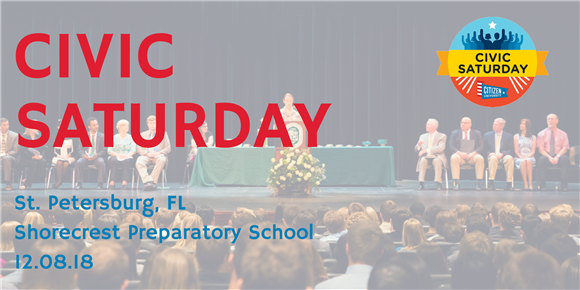 On Saturday, December 8, Shorecrest Preparatory School is hosting a student-led Civic Saturday event. Civic Saturday is a national series of events meant to evoke community conversations around democracy, citizenship, and civic engagement. The event will run from 10:30am-11:30am in the Janet Root Theatre at Shorecrest and will be led by Shorecrest Upper School student Sophie Elwyn '19 with support from faculty sponsor Diego Duran-Medina, Director of Service Learning at Shorecrest. Civic Saturday events focus on one central question around citizenship. The model of Civic Saturday events follows a similar format nationwide, however the content of each event is entirely up to local event organizers. For this nonpartisan event at Shorecrest, the question is “Why Do Civics Matter?" This particular Saturday features special guest Kerry Kriseman, public relations specialist, avid non-profit volunteer and Board member, Southeastern Guide Dogs puppy raiser and recipient of The President’s Call to Service Award. In her free time, Kerry enjoys being an “accidental political spouse” as wife to St. Petersburg Mayor Rick Kriseman. The event includes a poetry reading and brief talks from event organizers Elwyn and Duran-Medina. Civic Saturday will close with Civic Circles, small group discussions of the central question and ideas presented. According to Duran-Medina, "We need to reimagine civics education, and that begins with listening to students with help from our St. Pete community." Diego Duran-Medina was instrumental in bringing this event to the Tampa Bay Area.